Cancer Love Horoscope 2017 foretells that Cancerians will be very much enamored by love and relationships this year. Matrimony and social affairs will also be their major spheres of activity. Cancer, socially you are full of enthusiasm compared to the previous year. You will be successful in enlarging your social network with the induction of many new friends. Your personal magnetism is superior and you have no problem in drawing more influential people into your social circle in 2017. This in turn will provide you with many romantic opportunities. Your social contacts will also help you in your career growth. Some Cancer friendships might even turn into love relationships. Too much of your social activities may take a toll on your personal liberty and may drain your vitality in 2017. The love horoscope 2017 predicts that financially also it may be taxing your resources. Hence you have to be careful and restrict your flirting activities to match your physical and financial resources. Your social engagements should also not affect your marital relationships. Balancing of social and love life is of utmost importance to the Cancer zodiac sign in 2017. 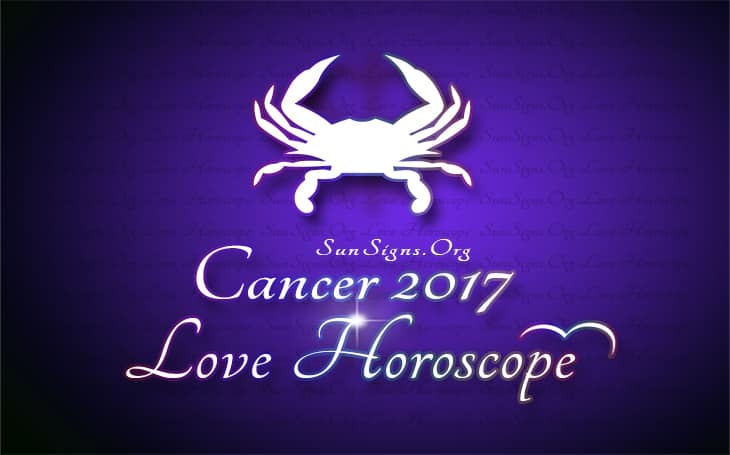 The love astrology 2017 predictions for the Cancer sun sign foretells that crabs eligible for marriage will enter into serious love relationships this year. They will be looking for extremely sophisticated lovers or partners who are intellectuals and who are morally inclined. Service oriented people and fitness freaks will catch your attention. You may find love among medical practitioners. You will also be able to find romantic partners in social functions and celebrations or while dating online. The 2017 Cancer love predictions suggest that marital relationships will be more romantic and sexually stimulating. Married people will enlarge their social network. People looking for a second marriage will have no problem in attracting love mates and will find their partners in people engaged in fine arts and spiritual activities. The Cancer personality will be charming and gracious with their soul mates. If you are married for a second time, your marital life will be harmonious as your spouse will be less demanding and will allow your space. Your partner may encounter some monetary challenges. If you are a Cancer in love looking for a third marriage, marital prospects are not bright this year and the present status will continue. Planetary influences will dictate your romantic moods and pregnancy demands during the various months of 2017. Married life of a brother or sister of the Cancer man in love may be quite volatile and unpredictable till the month of April 2017. Situation will turn out to be better after that and married life will be more enjoyable. Unmarried siblings will have many openings for getting into love relationships. These affairs are not serious but will have lot of pleasure excellent love compatibility. Love life of children will not see any major fluctuations in 2017. Singles will pursue love mates while married ones will continue their marital relationships. The Cancer love horoscope 2017 predicts a period of marital bliss and excellent compatible relationships.